“Avoiding an opponent's strength and attacking his weakness” is an important principle in combat. The strength of a Muay Thai fighter lies in his fast, powerful kicks and elbow strikes, and his weakness is his lack of solid stances. Hence, a good tactic is to let his elbow strikes and kicks pass, instead of blocking them, and counter-strike. Then fell him onto the ground to subdue him. Here is yet another tactic. Eugene Butterworth counter-attacks as soon as Andy completes one move. This tactic is somewhere between letting an opponent complete a series of attacks before countering, and countering as soon as an opponent moves. Eugene and Andy repeat the attack and counters. Grandmaster Wong explains that Eugene correctly follows the opponent's momentum, and not going against it. 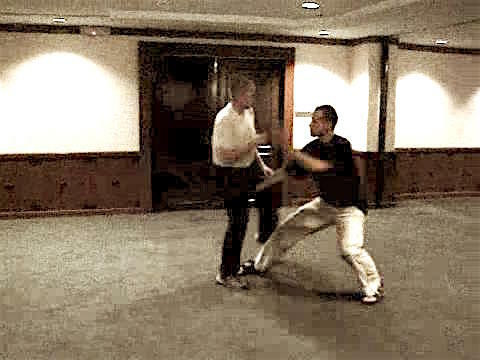 In the counter against the knee jab, Eugene deflects it upward, not blocking it. Eugene and Andy demonstrate the attacks and counters again. Eugene's counters match excellently with Andy's attacks. What would Eugene do if Andy changes his attacks, like using a jab instead of an elbow strike, or a left kick instead of a right kick. Eugene would modify accordingly. After avoiding Steve's initial two attacks, Andy moves in with an elbow strike as Steve tries to grab him. Grandmaster Wong explains that Andy could have used a long-range hand strike instead of a short-range elbow strike. But if the objective is also to fell the opponent as in this case, moving in with an elbow strike is appropriate. Andy and Steve repeat the attack and counter sequence. Grandmaster Wong explains that one must move in correctly to deliver an elbow strike, as Andy demonstrates. He should move in such a way that the opponent cannot strike him. Notice that George's strategy here is different from that of Andy. As Daniel attacks with a sweeping kick, George strikes the kicking leg. Then he covers the opponent and continues to strike him. Grandmaster Wong asks George to subdue the opponent onto the ground for better control. George acts on Grandmaster Wong's advice. After striking the opponent, George fells him onto the ground for better control and more strikes. In kungfu terms, this is called “tak sai pat siew yein”, which means “not letting an opponent escape when you have an advantage”. George and Daniel demonstrate the attacks and counters again. George intercepts the Muay Thai fighter's moves and subdues him. It contrasts sharply with attacking the opponent when he has completed his series of attacks. But whatever the strategy chosen, to be effective you must know the likely attacks the opponent will use. 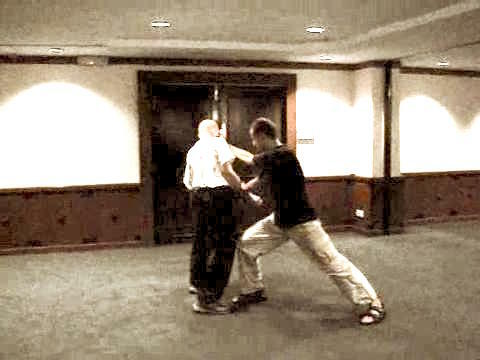 Shaolin Strategy of Avoiding Opponent's Strength and Attacking his Weakness from Wong Kiew Kit on Vimeo.